After 17 years of construction, a splendid Armenian Cathedral complex was opened in Moscow this week, combining the centuries-old traditions of Armenian architecture, modern solutions and reflecting the hopes of half a million strong Armenian Diaspora in Moscow for the prosperity of their community and expectations for the new stage of Armenian-Russian relations. The consecration of the complex was led by His Holiness Karekin II, the Supreme Patriarch and Catholicos of All Armenians, and attended by Armenian President Serzh Sargsyan, Patriarch of Moscow and All Russia Kirill, as well as by government and public figures of Armenia and Russia and representatives of religious denominations. Catholicos Karekin II presented the cathedral, called the Holy Transfiguration, what is believed to be a particle of the cross on which Jesus Christ was crucified. The construction of the complex has largely become possible thanks to Bishop Yezras, who over recent years attracted investments and revived the project that was factually frozen due to the lack of funding. The area for construction was allocated by the Moscow authorities yet in 1996 on the territory adjacent to Olympic Avenue. Construction was scheduled to be completed by 2001, but it was stopped soon after the project was launched. The foundation of the cathedral was laid in 2004. The complex which covers an area of 1.32 hectares includes the Cathedral, the chapel of the Holy Cross, a museum, a library, bishop's residence, conference rooms, educational complex, guest house, refectory, and underground parking for 200 cars. The Cathedral’s perimeter is decorated with the carved images of the Savior, images of saints, crosses, inscriptions of St. Mesrop Mashtots and historical plots, telling the adoption of Christianity in Armenia, the creation of written language and the life of the Armenian martyrs. The Cathedral, resembling ancient temples of Armenia, has four entrances; the main entrance is located on the bell tower, which has stalactite vault- the unique type of decoration coverage, forgotten since the Middle Ages, and used after seven hundred years for the first time in that cathedral. The height of the Cathedral, together with the cross makes 58 meters; the diameter of the dome, decorated with 72 crosses, is 21 meters. "Armenian architecture is peculiar with its austerity. But we believe that beyond we need to show the best that we have achieved over the centuries, such as rich architectural forms, decorations, ornaments, bas-reliefs, pictures of saints,” said Artak Gulyan, the architect of the complex, which was built mainly on tuff, brought to Moscow specially for the cathedral’s construction from the village Anipemza of Shirak’s province. The opening of the Cathedral took place two weeks after Armenia’s decision to join the Customs Union – a decision that Armenian authorities called unlikely a few months ago, and which, according to many local analysts, would cost Armenia the closure of European doors. Armenian-Russian relations have been given a considerable part in the official speeches of both of the Armenian and Russian religious leaders. Patriarch Kirill said that the opening of the temple is “the recovering of historical justice”. He noted that the Armenian community has suffered along with other Christian communities in Russia during “hard times” (meaning religion’s repression during communism), and the churches that were built with love by Armenian people in Russia have often been destroyed. 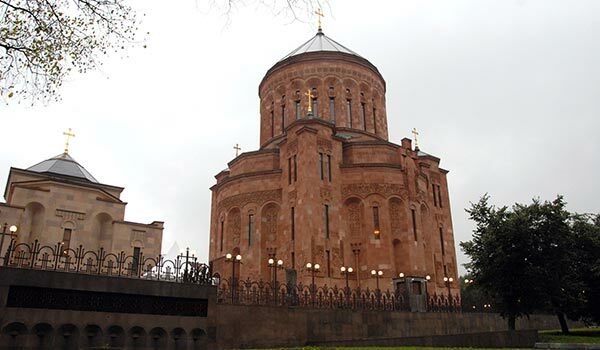 Leaving politics aside, many view the new Armenian Cathedral as a striking example of Armenian architecture, and the pride of the Armenian community in Moscow, the city which hosts, according to various estimates, from half a million to a million Armenians. Until recently, the spiritual place for Armenian community was a small chapel in the Armenian part of Vagankova cemetery, where religious holidays ceremonies, funerals, and weddings and been held. The size and the location of the chapel had long ago become impractical for meeting the needs of parishioners. The new church complex is the largest complex of the Armenian Apostolic Church outside of Armenia, after the Mother See of Holy Echmiadzin.